Banteay Srei, one of the Siem Reap temples further afield, is located 37 kilometers northeast of East Mebon. The road to the temple is in very good condition and it takes about 50 minutes by car from Siem Reap. 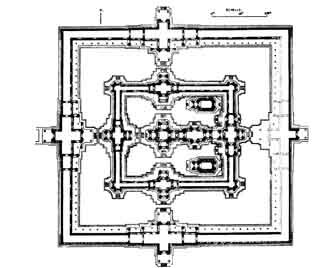 As you can see from our Banteay Srei plan the temple has a rectangular shape and is oriented to the east with three enclosure walls on the main East West axis, a moat and the central sanctuary. One of the most popular routes is to approach the temple from the east, crossing the main outer Gopura. In the porch of the gate you can see an exquisite carving of Indra riding a three headed elephant. Ahead of the gate there is a causeway called the Processional Way and on each side of the causeway you will see the remains of sandstone galleries and halls with a north-south orientation. Some of these halls shelter beautiful lintels. At the end of the causeway to the south lies the pediment that belongs to the Gopura in front and it portrays the abduction by a demon of Rama's wife, Sita. Once you pass the second Gopura you will be walking across the walkway over the moat that will lead you to the inner wall and the central sanctuary. The entrance tower of this inner wall has inscriptions in the door jambs. The central area of the temple contains two libraries on the south-east and north-east corners. Ahead of these two buildings there is a platform that sustains three shrines in line in a north-sout direction. Two of the shrines are dedicated to Siva and the one in the north is dedicated to Vishnu. The central complex is so reachly ornated that there is hardly any space left uncarved. Take your time to contemplate the decoration of the central sanctuary, it is considered a masterpiece of Khmer art. You can exit the temple both from the east or the west entrances.